Very related to this question. While it's already clear that several TP4056 can't be used to charge and discharge several cells, it's not clear to me if it's possible to only charge a battery pack with several cells in series. The input and output GND pads are connected, but what about the battery terminals? From the TP chip datasheet I fear that B- pad is also connected to GND, and therefore i can't charge a battery pack from it's balance connector, but i'm not that good in diagram reading and understanding and i hope to be proven wrong (maybe thanks to the additional protection chip, dw01 if i'm not wrong). it's not clear to me if it's possible to only charge a battery pack with several cells in series. 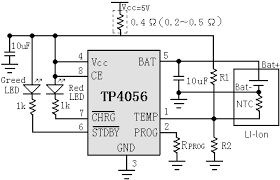 DESCRIPTION The TP4056 is a complete constant-current/constant-voltage linear charger for single cell lithium-ion batteries. Note how the - terminal of the battery is also grounded. On the module you can also easily see (and measure) that IN- / GND and B- are shorted. So indeed, the TP4056 is not suited for balanced charging of series connected cells. If you need to charge series connected cells then you need a different IC. Not the answer you're looking for? Browse other questions tagged batteries battery-charging lithium-ion lipo or ask your own question. How to connect Li-ion batteries with thermistor pin in parallel? Charging 18650 cells in parallel? Multiple TP4056 Li-ion in 8s Pack - How much voltage? How to charge this lipo back? Is it safe and efficient to charge a Li-Ion cell from mixed alkaline cells?